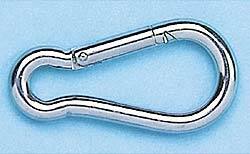 A stainless steel snap hook like this one makes it easy to attach your dinghy tow line. Floating plastic 3 strand rope makes a great dinghy tow line. A 3 strand nylon line works quite well too, but presents a few problems because it sinks. Once the main boat reaches cruising speed, take a look at how the dinghy is riding. It's best to keep the dinghy riding on an "uphill" part of the wake of the cruising boat. It keeps the bow of the dinghy up, and makes the dinghy less likely to surf up into the big boat in following seas. Adjust the tow line as needed to allow the dinghy to ride the wake properly. Most people like to use a clip of some type to connect the dinghy tow line, because it is quick and easy. I like stainless steel snap hooks, because they are smooth and less likely to damage boats. Get a stainless steel thimble of a size that barely fits into the narrow end of the snap hook, then splice the tow line on with the thimble in place. It should not be able to come out when towing. I once had one of these clips fail when towing a dinghy, but I still don't know how it happened. Fortunately, we had hooked a large trolling rod onto the dinghy, with enough line let out to remain slack under tow. The clicker on the drag immediately let us know that the dinghy had gotten loose, and we went back to retrieve it. The stainless snap hook had somehow come open when the dinghy overtook its own tow line while surfing on large waves. It was not bent or damaged when I pulled it in, and I put it right back on the dinghy. It had given years of trouble free service before that incident, and I have used it for years since, without any recurrence. A second tow line is another alternative, but it can tangle with the primary tow line, and if something happens to the primary tow line, you may not discover it immediately. For offshore towing, redundant tow lines are a good idea if you can keep them from interfering with each other, but a fishing rod with a drag clicker set is still worth setting. It saved my dinghy. It is best to use a floating tow line, but even those can be swept under the cruising yacht, possibly becoming entangled with the rudder or propeller. A short tow line will prevent the dinghy from turning completely around, and will prevent the tow line from getting snagged on something underneath the big boat. When a cruising boat backs down to let out anchor rode, it will often bump into its own dinghy. A hard hull dinghy can scratch the yacht. Inflatable dinghies usually won't hurt the larger boat, but black rub rails can leave streaks. If a crew member is available to fend off the dinghy, it's not a bad idea to assign one to that task. Even with an inflatable, the dinghy should be kept on a very short leash when anchoring or docking. If the tow line is too long, the dinghy can rotate 180 degrees and contact the big boat with the transom. This is especially likely, and can do the most damage to both boats, if the dinghy engine remains mounted at all times, rather than being brought aboard the larger boat during towing. Another alternative to a short tow line is to bring the dinghy alongside the larger boat and secure it there. This also accomplishes both goals of keeping the tow line out of trouble and keeping the dinghy from contacting the big boat with its transom or engine. An easy way to do it is to bring the dinghy close enough to grab the stern line, and just walk the stern line forward, swinging the dinghy around and alongside facing aft. The dinghy stern line can be temporarily secured to a stanchion or shroud while anchoring or docking. When docking with a dinghy in tow, it is particularly important to keep the dinghy out from between the big boat and the pilings, and from between the big boat and other boats. If there's room, tying the dinghy backwards alongside the big boat is the easiest technice. Or you can tie the dinghy on a very short line horizontally across the stern of the boat, if you're docking bow-in. If you're backing the big boat to the dock, then have a crew member walk the dinghy alongside the boat to the bow just before or during the approach. If the crew member is needed for docking, have them tie off the dinghy to a bow cleat, on a very short leash. While docking, you're maneuvering at very slow speeds and only for a very short distance, so it doesn't matter if the dinghy "rides well" or if it's in the right position for towing. If the slip or dock space is extremely limited, you can always have a crew member hop into the dinghy and cast off from the big boat, then bring the dinghy in after the boat is docked. Make sure there's a paddle in the dinghy before casting off! People may give you funny looks when you're coming into a marina or anchoring your boat with the dinghy tied backwards alongside, but it's quick and easy, and it works. If you want to proceed above dead-slow maneuvering speed, or if there is any chop at all, it's best to turn the dinghy around if tying it alongside. Waves will splash over the transom, and many self-bailing boats can be self-filling if pulled backwards through the water.